The USDA Foreign Agricultural Service (FAS) has posted U.S. hay export totals for 2017 and the news on the export front continues to be largely positive. 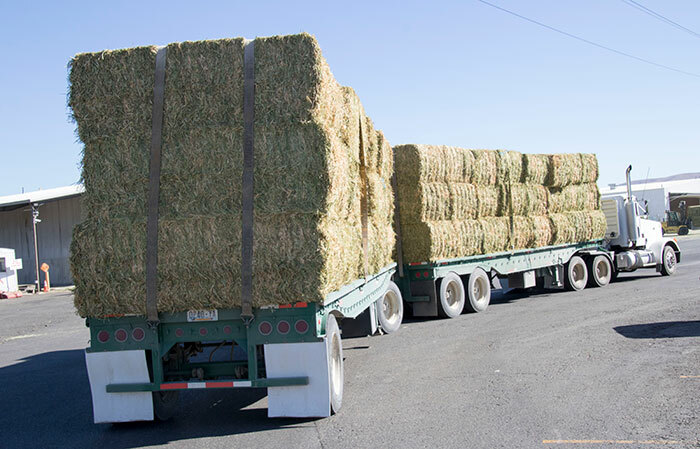 Total exports of alfalfa and other hay (think grass) hit 4.2 million metric tons (MT). That exceeds 2016’s exports by 6.3 percent and marks the first time that the total of alfalfa and other hay exports have exceeded 4 million MT, based on USDA-FAS data. Alfalfa hay exports in 2017 totaled a record 2.7 million MT, up 7.2 percent from 2016 and the third consecutive year of alfalfa export year-over-year growth. When speaking of alfalfa hay exports, China remains the 800-pound gorilla in the room. 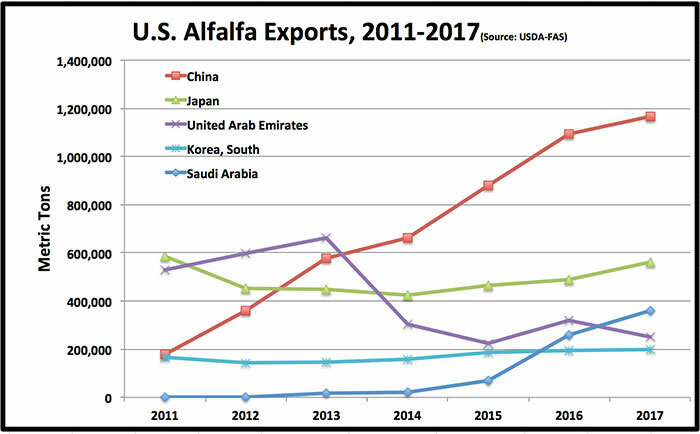 They purchased 1.17 million MT of U.S. alfalfa during 2017, more than double the amount bought by Japan, the second-place importer of U.S. alfalfa (see graph below). Exports to China were 6.8 percent more than 2016. This percentage bump was less than during the previous two years, perhaps indicating that we’re moving toward the end of the huge growth in that export market. During the past five years, alfalfa hay exports to China have risen a whopping 226 percent. Japan’s alfalfa hay import total of 0.56 million MT was 14.6 percent higher than 2016 and was that country’s largest amount of U.S. alfalfa purchased since 2011. The past year marked the third consecutive year of higher U.S. alfalfa exports to Japan. Vaulting into third place as an export partner for U.S. alfalfa was Saudi Arabia. The Saudis imported 0.36 million MT in 2017, 40 percent more than the previous year’s total. As recently as 2014, Saudi Arabia was essentially a nonplayer in the export market. The reasons for their meteoric rise as an alfalfa buyer relates to that country’s well-documented phase out of domestic alfalfa production to conserve water while still sustaining their domestic dairy industry. 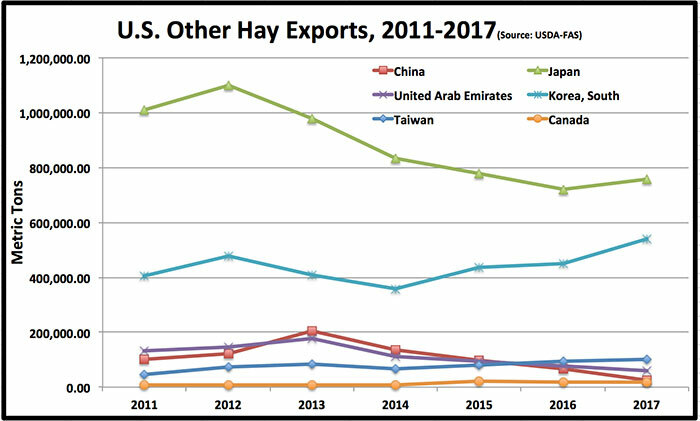 Of the top five leading alfalfa hay-trade partners in 2017, United Arab Emirates (UAE) was the only one that imported less U.S. alfalfa than in 2016. Their import total of 0.25 million MT was down 22 percent from the previous year. In 2013, the UAE had imported 0.66 million MT, which is their historical high-water mark. South Korea imported 3.2 percent more U.S. alfalfa in 2017 than 2016. Exports to the current Winter Olympics host country have remained rather stable in recent years, nearing 0.2 million MT. USDA-FAS reported 1.53 million MT of hay other than alfalfa was exported from the U.S. in 2017. That was 5 percent more than in 2016 and a similar amount to what was exported in 2015. Japan leads all export partners for nonalfalfa hay. They imported 0.76 million MT in 2017, 5 percent more than the previous year (see graph below). South Korea raised their import total of U.S. hay other than alfalfa by 20 percent in 2017 with a finishing tally of 0.54 MT. Rounding out the top 5 export trade partners for other hay were Taiwan (0.10 million MT), UAE (0.06 million MT), and China (0.02 million MT). China’s total was down 63 percent from 2016. Total U.S. hay exports continued to rise in 2017, eclipsing 4 million MT. Hay exports still remain a small portion of total U.S. hay production. 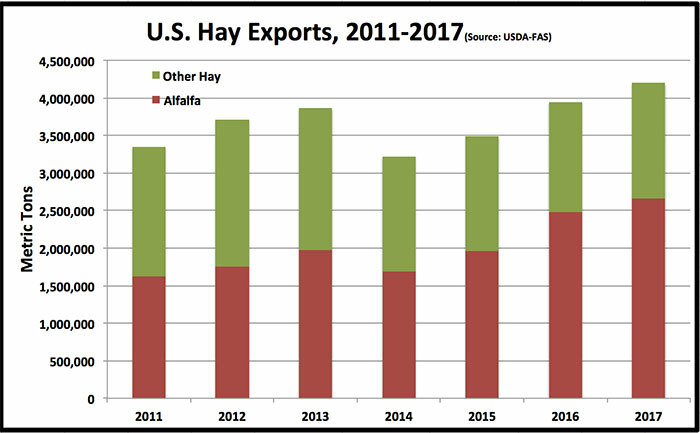 Based on USDA production data for 2017, only 3.5 percent of all hay produced enters the export market and about 5.3 percent of U.S. alfalfa does the same. In the seven Western states of Arizona, California, Idaho, Nevada, Oregon, Utah, and Washington, hay exports play a much larger role in impacting markets and prices. According to Dan Putnam, University of California forage extension specialist, hay exports make up about 51 percent of the grass hay production and 15 percent of the total alfalfa production in those Western states.